So I didn’t watch too much last season, but amongst the limited set of stuff I perused this song caught on to me best. Koi Boudou is the ED to Binbougami Ga, which is a show that looked somewhat cheap at the beginning, but which turned out to be something quite worthwhile after all. The shoddy production values and the non-novel (but still funny) slapstick comedy aside, the show took the “reach through Ichiko’s apparently bad personality into the lonely but kind person underneath” part of the story surprisingly seriously and played it all out with a satisfying level of depth. I liked it. I also like that “people are nicer than they seem on the surface” is a commonly recurring theme in anime. It’s an idea well worth being constantly reminded of. The song Koi Boudou has this bouncy, cheeky feel that I felt helped define the mood of the show. Also in particular, one of the things that really caught me is how the lyrics and the presentation of the accompanying video made the song seem to resonate deliciously with the outwardly-obnoxious yet innerly-lovable nature of Ichiko’s personality, as well as with her love-hate relationship with Momiji. Alas the world is sometimes an ugly place – I listened to the full version and realized that the setting is really that of a girl complaining about another girl flirting with her guy. Le yawnz, terrible! So terrible that we at Between Linux and Anime are just gonna pretend the full version never existed. Ostrich head-in-sand style. So what we have here is the TV version! The one ambiguous enough that we could fancy it being about the broken relationship between our main characters – hate, dislike, laced with grudging care and inexorable love. In fact the way the video is arranged I think hints that Sunrise themselves intended this fancy to some degree. We shall fancy away and savor it then. As usual, you can hit F8 to listen to it while it’s up (or play it from the player at the sidebar). Hit the jump for some pictures, Romaji lyrics, and translations. Enjoy! This is a pretty nice song, possibly my favorite in its season. Vidro Moyou felt like an essential component of the overall mood and style projected by NatsuMachi (Ano Natsu de Matteru), and its wistful, relaxed yet melancholic tune really contributed to the sunny, rainy, adolescent feel of the show. NatsuMachi tended to end its episodes on slight cliff-hangers, and Vidro Moyou, ever dreamy, ever contemplatory, was always a great tune over which one could lightly reflect on the going-ons of the show. Some EDs are great like that – they almost become an extension of the show itself, and contribute directly to its appreciation. The lyrics are pretty nice too. It’s a little difficult to translate, but I’m fairly happy with my version. A New Theme and a Christmas Anisong! And so not to be out-awesomed and outdone by Eri Uri, I have also decided to give my blog a makeover! Oh who am I kidding, the new Neonovic has got more bells and whistles and tinkerdust than a confetti-showered parade of Christmas trees, well beyond anything I can hope to match, especially in a day (and yes, that means it’s awesome and you should click through to check it out, even if the last post was dated October). So what’s up with the makeover then? What was wrong with the old theme? What’s awesome about the new? Nothing and nothing much, really. The old one’s just been alive for far too long, and the yellow-orange motif was beginning to look like withering parchment to me, and so I decided, having recently returned from snow-covered Hokkaido, to switch into a cozy dash of white and blue. And so et voila. Everything is pretty much arranged to work like the old theme, except I finally caved and decided to support threaded comments. Hope the new look is a breath of fresh air though. I at the very least find it quite pleasant, and seasonally apt too. Of course, little teething problems and issues might still lurk around little dark corners, so if something breaks or misbehaves, just drop me a comment. Anyway, it’s nearly Christmastime! And with it becoming increasingly clear that my next editorial isn’t going to make the next two days, I did the next best thing – I wrote this post :P Well, I guess an Anisong post is kinda better in the way of a season greeting anyway. Here’s “Attaka na Yuki“, or “Warm Snow”, which was a Christmas-episode insert song by Miki, Yayoi and the Futami twins in the Idolmaster anime. Now that’s a show I’ve been enjoying somewhat more than I expected to. 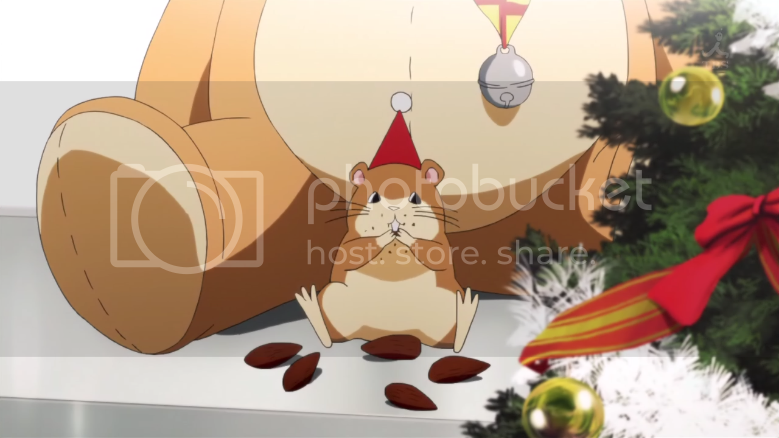 In a sense the Idolmaster anime is somewhat like Christmas. There’s plenty to complain about if you’re set on complaining. Strawman villains, moe-mongering, manufactured drama, just like how the cynics would tell you Christmas is a capitalistic farce where the name of the game is to tell your loved ones you love them by spending lots of money. But just as Christmas is also (is more, I’d argue) about giving, about sharing and cheer; you could say the Idolmaster is really about the cocktail of positive themes that form the core of its storytelling: positivity within adversity, pursuit of a dream, comradeship, and danketsu, as Keiri would put it. And while there are points in which things get a little contrived, and points where more tender loving care for character development could be desired, they are counter-balanced by the handful of moments where the show manages to hit strong, evocative highs. All in all it’s a pretty enjoyable watch, and the long history of the franchise also translates into a lot of depth in terms of inside jokes and fun little seiyuu intrigue, but I’ll refer you to Keiri-the-veteran’s blog for more of that. As for here, as usual, you can hit the jump for romaji lyrics, translations, and a picture, and hit the F8 key to listen to the song while it’s up. Hope you folks had a great year, and enjoy Attaka na Yuki. Decided to do this one after all. This is the ED to the second film of the animated film series Kara no Kyoukai – the Garden of Sinners. It is a pretty nice song on its own, but it only truly resonates when savored in its intended context – as a curtain-closer to the second film. So if you haven’t watched it yet, I highly, highly recommend you go do so. Yes, watch all seven films. You won’t regret it. 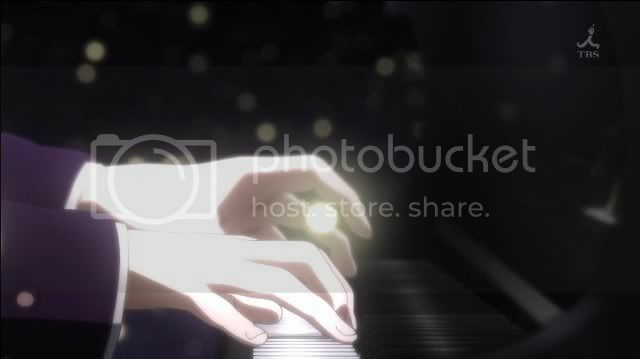 Anyway here it is, “Kimi ga Hikari ni Kaete yuku”, or “You return it to light”. Quite possibly a love song at its core. A dreamy song that traverses a spectral path from shimmering melancholy to triumphant catharsis. As usual, hit F8 to listen to it while it’s up, and hit the jump for a picture, romaji lyrics, and translations. Haven’t made an anisong post in awhile, so thought I’d do one and take the chance to put my music playing scripts back. I will always remember Air (TV) as the first show to profoundly affect me after Haruhi first got me serious about anime. In retrospect now Air wasn’t perfect. The way the plot was arranged and presented was somewhat confusing and jarring. Even so Air still contains, in my opinion, some of the most powerful and evoking storytelling I’ve ever seen. It was beautiful, and it had a very unique taste that I feel nothing has quite been able to parallel to the present day. Oh how I wish I could feel it again. I vividly remember that stormy midnight, 3 years or so ago now, when I finished episode 6 with my breath stolen and my heart burning in the exultant realization that I was watching something truly great. This is a dedication to Kawakami Tomoko, who passed away from ovarian cancer on the 9th June 2011. Voice roles I will remember her by include Athena Glory of Aria, Sayuri Kurata of Kanon, and Kamio Misuzu of Air. As usual, hit F8 to hear the song, which I believe was performed by Kawakami Tomoko herself. Hit the jump for a pretty picture, romaji lyrics and translations. Or “Looking for a Lost Child”. As promised, this is Nanami’s song at the end of Katanagatari’s episode 7. Expectedly, the seemingly idyllic melody hides sorrowful lyrics, of death-seeking and final release. Very beautiful, very lonely song by Mai Nakahara, and the only song I heard this season that had a real chance against K-ON’s “No, Thank You”. Anyway, it seems like official lyrics for the song has not been released yet, and the transcriptions I’ve found from fishing around vary slightly. I have chosen to use the one from here, which is the one my ear seems to agree with the most. Anisong of the Season: Listen! Late as usual! But then it was pretty damn hard to finally decide on the Anisong of the Season this time round, actually. I nearly gave it to “Brave Song”, the Angel Beats ED. I really like Listen!’s tune and I adore the awesome animation sequence that accompanies it, but Brave Song was itself a pretty great song and it had this really amazing resonance with Angel Beats and its themes that gave it an evocative, emotive power, something Listen! doesn’t quite enjoy as much with K-ON!! IMO. Ultimately though, it was the lyrics and lyrical arrangement that clinched it when I looked them up for this post. Brave Song has great lyrics, but I really like the musical, rock spirit of Listen!’s. If you have not been paying attention to what Mio was singing in those ED’s I invite you to give my translation below a taste-over and see if you agree with me. The rhythmic way some words are slurred and hop-scotched over and the unstoppered gush during the chorus was great, and Yoko Hikasa just blitzing through the whole thing was fantastic. KyoAni’s composers sure know how to make Mio sound awesome. Speaking of Angel Beats, that was quite the disappointment :( In a bizarre coincidence I had been doing a rewatch of Munto with a friend and at the end of Angel Beats I found that I had mostly similar complaints for both shows – not enough build-up and flesh-out, rushed pacing, bad endings. Just… wasted potential. Maybe I should do a rant-post on Angel Beats sometime. Back on topic, I present you my chosen Anisong of the Season – Listen! ED to K-ON!!. The full version too for extra awesome. Hit the jump as usual for romaji lyrics and translations, and hit F8 to hear the track while it’s up. And that post title just flowed its merry way out of my typing fingers like it owned the place, causing me to gag in an uncontrolled, appalled fashion at its terrible cheesiness. On the off chance that anyone might be disappointed that this isn’t in fact my long overdue Angel Beats post – it’s coming, I hope. Rapidly catching up on my backlogs for that show now, and it definitely deserves something. Just hope I get to do it sooner rather than later.